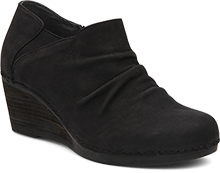 The Dansko Black Burnished Nubuck from the Luann collection. 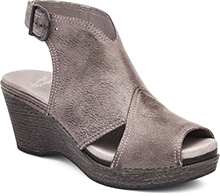 This stylish and chic wedge heel bootie, the Luann, is both on-trend and built with comfort in mind. 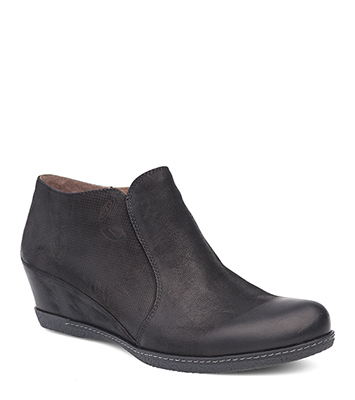 Outfitted with a removable footbed with Dansko Natural Arch technology and a long-lasting rubber outsole, this heel is inspired by the modern working woman. The Laurel carries the Seal of Acceptance from the APMA (American Podiatric Medical Association). The APMA Seal of Acceptance is awarded to shoes that promote good foot health and is independent proof that Dansko shoes are made with your comfort and long-term wellbeing in mind.